Student grants / Financial assistance Some of the programmes are entitled to a scholarship in the form of a discount deducted from the full tuition fee. Financial assistance is awarded to newly admitted students with SAT score over 1,200 (combination of reading and math sections) or a TOEFL iBT score over 90. Exchange partner schools IUC has established many international academic partnerships. Over the years IUC has been proactive in developing a wide network of Erasmus partner universities in order to foster student and teacher mobility. IUC manages a number of European projects related to implementation of innovative learning approaches and promotion of tourism innovations across Europe, financed under the Leonardo da Vinci and Phare programmes of the European Commission. At the moment IUC is involved in the Atlantis Programme for EU – US cooperation in higher education and vocational training. Admission requirements Upon arrival, international students have to take an English exam which has two components – a written part and an interview. However, international students whose native tongue is English, or who can provide TOEFL IBT score of min. 79 points or IELTS band 6.0 (or the equivalent score from other internationally recognized testing systems), do not have to sit for the written exam. Applicants with insufficient English language competencies will be advised to enrol in an intensive language teaching semester (as a part of the whole study curriculum). To be able to undertake studies in September, students from non-EU countries should apply not later than June 15th as they will need at least 2-3 months for the official certificate and visa/permit procedures. Student profile Ratio of National/Foreign students: within the programmes with English language of instruction 12 % of the students are international. IUC awards bachelor degree after a three or four year course of study. 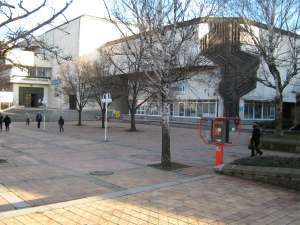 Currently more than 1300 Bulgarian and foreign students study at the IUC in five Bulgarian cities. The language of instruction in most of the programmes is English. The college is amongst the first higher education institutions in Bulgaria which managed to response to student aspirations and was able to meet the expectations regarding the establishment of double degree programmes. This initiative is relevant to objectives of the Bologna process and the lifelong and life-wide processes and strengthens the European dimension of the IUC and its attractiveness in general. Hotel Management in cooperation with Stenden University in the Netherlands the International Business Management Studies in cooperation with Arhnem Business Management Studies School at the HAN University in the Netherlands are amongst the high-profile programmes at IUC which attract every year a significant number of students. Another interesting educational opportunity is offered within the framework of the Sofia based programme in cooperation with the University of Portsmouth.